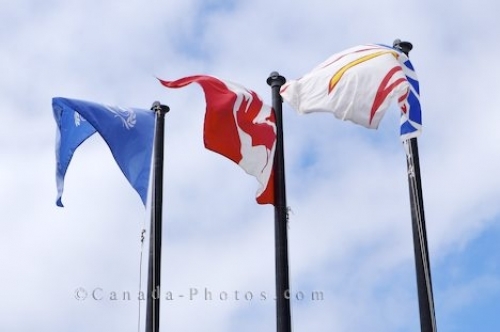 The flags at the information centre in the National Historic site of L'Anse aux Meadows in Newfoundland, Canada, flap in the breeze blowing in off the Atlantic Ocean. Outside most of the information centres around the world, there are flags flying which relate to the province, country and other important factors dedicated to the region. The information centre allows visitors to find out more about this Norse Village, what to see while visiting L'Anse aux Meadows and names of accommodations and dining establishments to take advantage of. Declared as a UNESCO World Heritage Site, L'Anse aux Meadows offers people a true sense of the Vikings and the way their life was. Picture of three flags at full mast at the Information Centre in the town of L'Anse aux Meadows in Newfoundland, Canada. ... (UNESCO World Heritage Site, Canadian, Newfoundland), at the Information Centre of L'Anse aux Meadows, Great Northern Peninsula, Northern Peninsula, Viking Trail, Trails to the Vikings, Newfoundland, Newfoundland Labrador, Canada.